Take a peek behind the scenes with A.E. 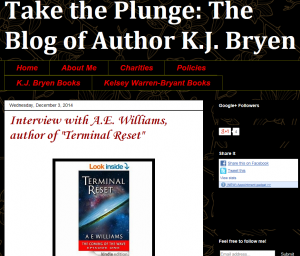 Williams as he writes “Terminal Reset – The Coming of The Wave”. K.J. Bryen asks the tough questions, and Mr. Williams gives his usual answers, incorporating his incisive wit, generous humor, and sarcastic worldview. It’s eye-opening, entertaining, and best of all FREE!